We analyzed 5 English language newspapers daily for 2 weeks from March 12th to 26th, one week of the newspapers in Lucknow and the second week in Bangalore. Facebook, Twitter, Instagram and Alphabet backed services such as Youtube and Google Plus were part of our survey. 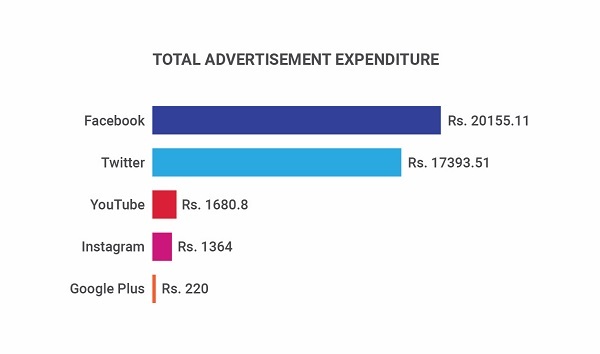 Of a total of 33 advertisements (14 in Lucknow+19 in Bangalore), Twitter stands out as the most prominent advertising platform used by government agencies with 30 ads but Facebook at 29 was more expensive. In order to ascertain the rates of publicity, current advertisement rates for Times of India as our purpose was to solely give a rough estimation of how much the government is spending. Advertising of this nature is not merely an inherent problem of favoring some social media companies over others but also symptomatic of a bigger problem, the lack of our native e-governance mechanisms which cause the Government to rely and promote others. Where we do have guidelines they are not being followed. By outsourcing their e-governance platforms to Twitter such as TwitterSeva, a feature created by the Twitter India team to help citizens connect better with government services, there is less of an impetus to construct better websites of their own. If this is so because we currently do not have the capacity to build them ourselves then it is imperative that this changes. We should either be executing government functions on digital infrastructure owned by them or on open and interoperable systems. If anything, the surveyed social media platforms can be used to enhance pre-existing facilities. However, currently the converse is true with these platforms overshadowing the presence of e-governance websites. Officials have started responding to complaints on Twitter, diluting the significance of such complaint mechanisms on their respective department’s portal. Often enough such features are not available on the relevant government website. This sets a dangerous precedent for a citizen management system as the records of such interactions are then in the hands of these companies who may not exist in the future. As a result, they can control the access to such records or worse tamper with them. Posterity and reliability of such data can be ensured only if they are stored within the Government’s reach or if they are open and public with a first copy stored on Government records which ensures transparency as well. Data portability is an important facet to this issue as well as being a right consumers should possess. It provides for support of many devices, transition to alternative technologies and lastly, makes sure that all the data like other public records will be available upon request through the Right to Information procedure. The last is vital to uphold the spirit of transparency envisioned through the RTI process since interactions of government with citizens are then under its ambit and available for disclosure for whomsoever concerned. Secondly, such practices by the Government are enhancing the monopoly of the companies in the market effectively discouraging competition and eventually, innovation. While a certain elite strata of the population might opt for Twitter or Facebook as their mode of conveying grievance, this may not hold true for the rest of the online India population. Picking players in a free market is in violation of technology and vendor neutrality, a practice essential in e-governance to provide a level playing field for all and competing technologies. Projecting only a few platforms as de facto mediums of communication with the government inhibits the freedom of choice of citizens to air their grievances through a vendor or technology they are comfortable with. At the same time it makes the Government a mouthpiece for such companies who are gaining free publicity and consolidating their popularity. Government apps such as the SwachBharat one which is an e-governance platform do not offer much more in terms of functionality but either reflect the website or are a less mature version of the same. This leads to the problem of fracturing with many avenues of complaining such as the website, app, Twitter etc. Consequently, the priority of the people dealing with the complaints in terms of platform of response is unsure. Will I be responded to sooner if I tweet a complaint as opposed to putting it up on the app? Having an interoperable system can solve this where the Government can have a dashboard of their various complaints and responses are then made out evenly. Twitter itself could implement this by having complaints from Facebook for example and then the Twitter Seva would be an equal platform as opposed to the current issue where only they are favored. Recent events have illustrated how detrimental the storage of data by these giants can be in terms of privacy. Data security concerns are also a consequence of such leaks. Not only is this a long overdue call for a better data protection law but at the same time also for the Government to realize that these platforms cannot be trusted. The hiring of Cambridge Analytica to influence voters in the US elections, based on their Facebook profiles and ancillary data, effectively put the governance of the country on sale by exploiting these privacy and security issues. By basing e-governance on their backbone, India is not far from inviting trouble as well. It is unnecessary and dangerous to have a go-between for matters that pertain between an individual and state. As this article was being written, it was confirmed by the Election Commission that they are partnering with Facebook for the Karnataka Assemby Elections to promote activities such as encourage enrollment of Voter ID and voter participation. Initiatives like these tying the government even closer to these companies are of concern and cementing the latter’s stronghold. Note: Our survey data and results are attached to this post. All research was collected by Shradha Nigam, a Vth year student at NLSIU, Bangalore. This report is based on a survey of government advertisements in English language newspapers in relation to their use of social media platforms and dedicated websites (“Survey”). For the purpose of this report, the ambit of the social media platforms has been limited to the use of Facebook, Twitter, YouTube, Google Plus and Instagram. The report was prepared by Shradha Nigam, a student from National Law School of India University, Bangalore. Read the full report here.